I did not think there was a way to improve upon apple pie. That is, until a coworker brought in loads of fresh-picked Honeycrisp apples. My apple pie recipe was good, but with Honeycrisp apples, it’s great. The only way to treat apples fresh off the tree with respect is to ensure they are tucked into nothing but a homemade pie crust. I believe that so many people resort to the box because of the quest for the appearance of perfection. A pre-made dough seasoned with chemicals will ensure that you don’t have to patch and repair your dough when rolling, but that’s not the point. Pie is meant to smell perfect and taste perfect, but not look perfect. If you’re scared, ease into it with my mini apple pie. You will need a 6-7″ pie dish and just 2 apples. I use my grandmother’s glass mini pie pan, but metal is fine. The only way you can mess up this recipe is to put too much water into the dough, or slice the apples too thick. Take your time; enjoy the process. When the pie comes out of the oven, you’ll agree there’s no better way to spend a Fall day than baking. I believe in making a seasonal to-do list, and making as many pies from scratch with fruit picked by me (or a coworker) is at the top of my Fall list. 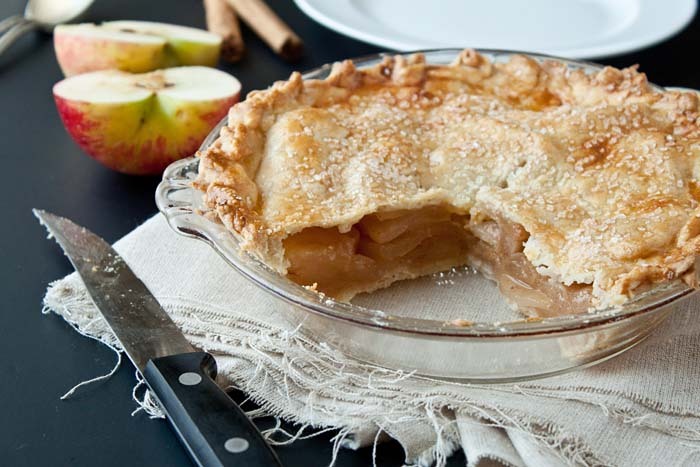 Scribble ‘make a homemade apple pie’ on your Fall to-do list. You won’t regret it. Another thing you won’t regret? : accepting that pie is a suitable breakfast option. The Pioneers and American settlers did it, so in an effort to go all-out vintage, I’m bringing back pie for breakfast. Settlers eating pie for breakfast might just be the only thing I learned in history class. This is me putting my education to work, one slice at a time. First, make the crust: Stir together the flour and salt in a medium bowl. Add the cold, diced butter and blend it using a pastry cutter or two knives. When the butter is the size of peas, use your hands to squeeze the dough in your hands. The warmth of your hands will help the dough come together in a few minutes. When the dough holds together in a clump when squeezed in your hands, place the bowl in the refrigerator for 10 minutes. After 10 minutes, remove the flour mixture from the fridge and add the apple cider vinegar and 2 tablespoons of ice water. Stir this mixture together with a fork until it comes together. Add more water as needed. Donâ? ?t add more than 5 tablespoons of water. Shape the dough into a flat disk, wrap it in plastic wrap and chill for 30 minutes. Have ready a 6-7â? metal pie tin and preheat the oven to 425Â°. Peel and thinly slice the apples. Cut the slices in half so that you have apple slices about 2â? long. Place the apples into a bowl and toss with the orange zest, cinnamon, allspice and sugar. Allow to set while you roll out the crust. On a lightly floured surface, divide the dough in half, but allow slightly more dough for the bottom crust. Roll out the bottom crust into a circle 1â? larger than the diameter of the pie pan. Drape the crust over the pie tin and gently fit it up the sidesâ? ?do not stretch the dough. Now, roll out the top into a 7â? circle. Have ready on the side. Pour the apple filling into the bottom crust, pressing the mixture down firmly to eliminate air gaps. Lay the top crust gently over the apples. Pinch the seams together prettily and cut two slits in the center of the crust for ventilation. Brush the pie lightly with milk and sprinkle extra sugar on top. Bake on the lowest oven rack for 20 minutes. Lower the oven temperature to 350Â° and move the pie to the middle rack to continue baking another 15-20 minutes, until filling is bubbling. Let cool at least 2 hours before serving. I totally agree that honeycrisps make apple desserts even better! 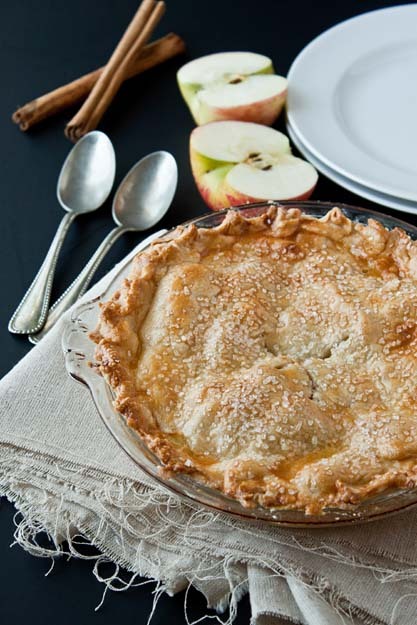 I’ve been wanting to make apple pie and wish I had a cute little pie dish to make yours! This pie is gorgeous and sounds absolutely perfect! Yum! Uh no it does not tell you what to do with the filling I am a beginner and I’m cryong in my kitchen why the will lies end, Sharon? Step 8 says to pour the filling into the crust. Everyone is a beginner at some time. Keep asking questions so you can learn! Hmmmm… I’ve got some vanilla ice cream in the freezer that would love to snuggle up next to this pie. Honeycrisp are the best. I can not get enough of them right now, but I swear they are going to make me broke! This pie to so pretty, very rustic, which in my opinion is the kind! I am one of those people who tend to go for the store bought, but I need to do my own crust. It is a good for the pie making season! Whee! I came home from the hospital last week, and promptly made one of these. Only, I don’t have a 6″ pie pan, so I used two tart pans, which worked. I then sat down and ate them. All by myself. Yes. With very little guilt. They were good. The end. Don’t make me tell Papa Swope! Oh, don’t tell him! My only guilt was that he could only have ice chips for 8 days. I was stressed, though, and everyone knows that a homemade apple pie helps a stress level. Oh, maybe I’m the only one that knows that. :) I did try to be a good girl and only use half of my pie crust and froze the other half. I’ve never done that, so I’ll be interested in seeing how it works. I’ll make him one, once he’s back to eating normally. He will have to share, though. I’m not that nice. Alas, a crust with butter and a recipe with real food ingredients, and smaller size. I am definitely trying this recipe. I can’t stand the store bought crusts for the same reason you mention, chemicals and hydrogenated oil (Yuck). And they don’t taste very good at all. Your crust looks yummy enough to eat off the monitor screen. I also like the size. I am single and I don’t need a whole pie. I can use my mini stone pan to make this one. Now I need to find some honey crisp apples. Thanks for sharing this recipe. Love your addition of orange zest to the filling! This pie is mostly apples so it is tooooootally acceptable for breakfast! Making an apple pie is definitely on my fall to do list! Along with getting Mike to go apple picking, I am soooo close to convincing him! I am absolutely swooning over your pie right now! It’ so so pretty, and has me very excited for apple picking this weekend! Yes, pie isn’t supposed to look perfect but yours certainly does! I would love to dive into it right now! My mom and I bake apple and pumpkin pies every year together and over the last few years we started trying other people’s recipes to change it up. This year, we’ll do yours, hurrrraaaaaay! Your pie crust looks perfect! Nothing beats a good old apple pie! YUM! I have long feared making my own pie dough, but it is on my list to try this year. I also adore Honeycrisp apples, so if I can manage to get my hands on some (their season is so short!) I will be sure to use them in my pie. Pie is my weakness. WANT. Amen to pie! I completely agree, pie is pretty perfect except for appearance, especially fruit ones. Boy do they taste great, even more so, right out of the oven. Your post was a reminder that I should bake Lenny a pie – he loves nothing more then an apple pie. Well, except he adores pecan too! A huge slice of this pie for breakfast sounds like a good day indeed. this sounds easy and delicious. I know you do recipes for 2 but do you have any idea what the amounts would be to make a regular size pie? have some apples coming and would love to make this for some friends with kids. You must have read my mind because I totally have a “Fall Bucket List” and make an apple pie is definitely on there! I have been on a bit of an apple kick lately and looooove Honeycrisp apples. Thanks for sharing…apple pie is my favorite kind of pie! Gorgeous gorgeous pie! It’s absolute perfection. Pinned! I have been using your crust recipe for my own small batch baking and cooking adventures for a year or so. It is absolutely the best small batch pie crust recipe on the internet. I had no idea that Pioneers and American settlers at pie for breakfast, but I will not forget it! Especially the next time I make one (which will probably be soon, cause man, your pie looks tasty!)! 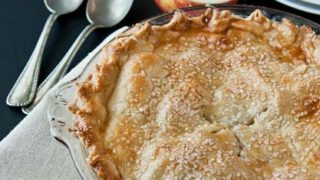 Simple apple pie is actually my favorite pie! Love that you made a small pie perfect for two! I can honestly say I have never made a pie out of Honeycrisp. I eat them way too fast before I can give myself a chance to bake with them! I’m gonna have to save some, and make this beautiful pie! Haha – I couldn’t agree more! Nothing depresses me quite like a store-bought pie crust. Pie is supposed to taste delicious, not look like the picture on a box. Also, apple pie was the first kind of pie I ever made with a homemade crust, so I have very fond memories of it. I think I used a mix of honeycrisp and gala apples at the time, with maybe one green one thrown in for a bit of tartness. Honeycrisp are definitely my favorite, though! 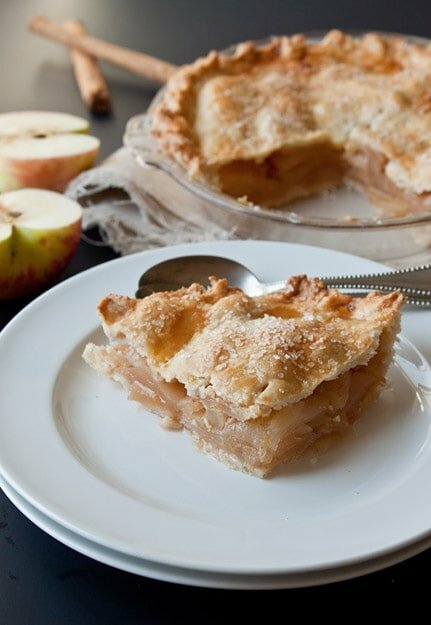 I am totally scribbling apple pie down onto my fall to-do list, along with apple picking if I have the time. Yum! I’m glad I have found your website. Very yummy looking pie. I will make this for my friend..perfect size. All I need is a pie pan. You said 2 apples were needed but the recipe says only 1. I just want to make sure this comes out great. Thanks!! I am reading the instructions for the pie crust and it states to add sugar, but sugar is not listed as one of the ingredients for the crust?!?!??? I am reading thru the comments this morning … majority cannot wait to make this pie. I was time crunched yesterday to fine a 6″ apple pie recipe, stumbled on yours, print and bake. Today I am back to read more. Thank you! Years of cooking for 6+ downsizing to 2 is – different. Good for you Young Lady! Your Mother must be busting with pride. You are going places. Do you think a 6in cake pan would work? 2 inch sides. I figured maybe bring the crust up half way. The only pie pan smaller than a 9 I have is an 8. I say go for it! But be warned the slices will be hard to cut out.. I made this today but used some Fuji apples that I already had. It was beautiful and delicious! Thank you! I made this yesterday and it was perfect for my boyfriend and I. I left out the orange and used brown sugar instead (personal preference) but the pie was delish and the crust was buttery and soft. I can’t wait to play with the filling and make different mini pies. My Newton Pippin apple tree did runneth over this year and I made 16 apple pies and froze them for apple pies for the holidays and during the year. I have never had a honeycrisp apple so will certainly try this recipe. Have to find the small pie pan. Have no idea where to look. Gotta love this old school classic, great recipe, thanks for sharing. Bought an adorable ceramic 6″ pie pan and have searched for a mini apple recipe for months. Thanks for this! Was it on your Instagram account I saw making miniature pies in muffin pans? Would it work here? How much allspice? Shows up asa question mark. Thanks. On my computer there’s a question mark next to allspice, so it says ? teaspoon allspice, would that be 1/4 or 1/8 teaspoon? glad to have found this – i just scored a tiny pie pan so i could make tiny pies, since it’s only the two of us at home. wasn’t sure how to scale things down from a full pie recipe, so this is very helpful. thanks! I just picked up two of these small Pyrex glass pie dishes at Goodwill last week. I’ve meter seen them before and thought they were too cute to pass up. While searching for a pie crust recipe for a smaller size pie plate, I came across this one. I cannot wait to try it! I wanted to try the crust recipe, and had problems because your flour measurements are off. 5 ounces is not a cup of flour, 8 ounces is. I never made a crust from scratch before and had to toss the whole thing and start over with a different recipe. No, Kathy, 1 cup of flour is 5 ounces. You’re thinking about liquid measurements, not dry flour. Please google.